Variations on non-instructional spending across the 286 school districts represent an opportunity to divert hundreds of millions of dollars back to instruction to help Kansas schools address our achievement crisis. 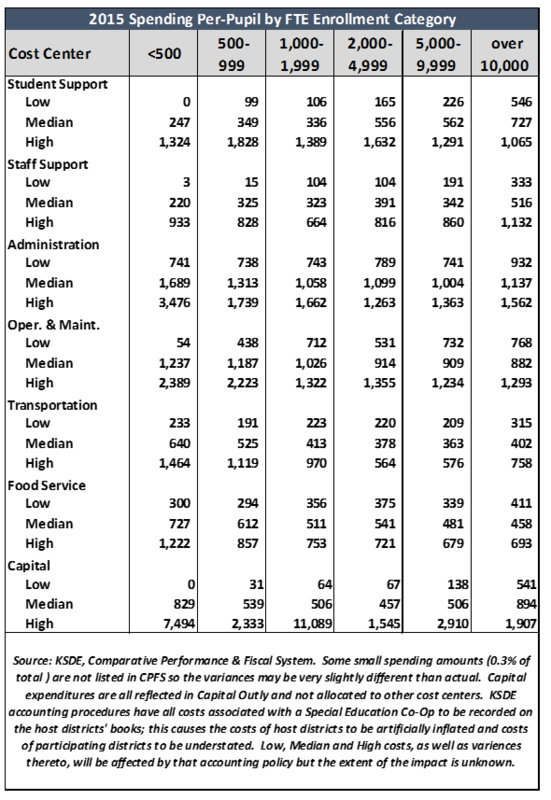 Data published by the Kansas State Department of Education (KSDE) shows that for the 2014-15 school year, spending exceeds $6 billion and averages $13,124 per-pupil. A closer look at this number exposes those wide variations in spending, both among the districts and among spending categories. Once again in 2015, Elkhart spent the least per pupil ($8,690; 988 students). The highest was by West Elk, which spent $24,927 per pupil on its 318 students. Given economies of scale it’s no surprise that a small district like West Elk had the highest per-pupil spending, although districts with even smaller enrollment spent considerably less. It would be expected that, in general, schools with smaller enrollment would have higher per-pupil spending than larger districts. However, even among districts of similar enrollment size, spending varies wildly. When grouping districts by size of enrollment these variations become quite apparent. For example, in the smallest districts (<500) the per-pupil spending on administration ranges from a low of $741 to a high of $3,476. The accompanying table is a summary of the low and high per-pupil spending by district size and spending category. The median expenditure in each size and category is also included to provide the mid-point. The median figures provide a target spending amount that exposes an opportunity for directing more dollars to instruction, which is why the instruction category was left off the chart. If every district that spent above the median for their school size reduced spending in that category to the median, as summarized in the table below, the savings across the state would be in excess of $380 million. Included in that amount is spending on capital outlay because it is mostly equipment and not construction costs. Also, now schools can charge maintenance and other operating expenses to that category. Certainly there are individual circumstances that might preclude every district from being able to spend at the median in every category, but smallness doesn’t preclude savings potential In addition to learning how similar-sized districts keep costs down, local school boards could contract with existing regional service centers to provide non-instructional costs. This concept is actually viewed quite favorably by Kansans (see Question #3), with 76% in favor and only 19% opposed. Other significant opportunities include outsourcing non-instructional functions to the private sector and negotiating statewide prices for commodities, supplies, insurance, equipment and other items. Some school boards and special interests object to these opportunities, often citing local control, but regardless of rationale, every objection is a conscious choice to divert money from instruction. Local school boards understandably expect the Legislature to provide adequate funding, but funding should be based on efficient use of taxpayer money. In fact, 73% of Kansans want the new school funding formula to require efficient spending and only 20% disagree (see Question #2). Redirecting money to Instruction is the starting point in closing achievement gaps and improving overall outcomes but the achievement crisis cannot be resolved with money alone. Even Governor Kathleen Sebelius said, “We cannot spend our way to excellence.”[i] School districts must also be held accountable for improving outcomes and spending money effectively. The Kansas at-risk program is a prime example. The state was spending nearly $400 million each year in at-risk funding and KPI revealed that the money was not being targeted to the very students the program was tasked with assisting. Districts must recognize that there truly is an achievement crisis and take both financial and instructional steps to address it. Being more efficient in their spending patterns and targeting more dollars to effective instruction is where it needs to start.